Original SWAT 165431 H.A.W.K. 9" Waterproof Side-Zip Boots FREE SHIPPING! The Original SWAT H.A.W.K. 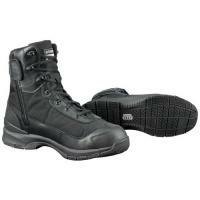 9" Waterproof Side-Zip boots provide enhanced protection and mobility in all conditions. They are based on an advanced non-marking, non-slip outsole that includes arch ladder grips and toe grips for improved traction. The molded nylon Flex-Lite stability board, TPU heel stabilizer and EVA midsole offer support and comfort, protecting your feet from injury and helping to reduce fatigue. The moisture-wicking lining keeps you dry and comfortable and includes AEGIS antimicrobial protection, helping to prevent odor buildup. The rugged upper is made from leather and nylon mesh, complete with a stitched toe to improve durability. The full bootie construction is waterproof, and the tongue is gusseted to keep out water and debris. It is also treated to protect against bloodborne pathogens, ideal for emergency scenes. ©2002-2019 CopsPlus.com: Original SWAT 165431 H.A.W.K. 9" Waterproof Side-Zip Boots FREE SHIPPING!